I’ve just ordered a Sofirn SP31T as the basis of compact thrower for use when dog walking and wildlife spotting. I’ve already got a Convoy C8 running a FET driver, but I wanted something that throws further and also has a side switch. The way I intend to use the light dictates the way I’ll end up modding it, so I thought I’d throw this out to the forum for advice/ideas. My initial thoughts are that the tailswitch will be there purely as a lock out. On/Off will be controlled by the side switch and it will only power up the emitter while you’re pressing the side switch. I only expect the light to be turned on for a few seconds (10 secs max.) at a time so the current to the emitter can be at the upper limit. So, what emitter would people recommend and what would the max current be? I’m very new to modding so any advice is appreciated. Could I run without a driver, straight off the battery? This light is similarly sized to a C8 (very similar head diameter) so it won’t necessarily throw any further. What emitter do you have in your C8? XPL HI? You can make this light throw a bit further if you use a smaller LED with higher luminance, but your beam size would be smaller. My C8 is running an XPL-HI. I like it a lot, but I find it a bit slow when I want a quick powerful beam of light to enable me to spot my dog. Hopefully the SP31T will be able to run higher current. What do you mean by slow? You can get a bit more power by going with a lower Vf emitter like a sliced SST40. Do you think you want more beam intensity or beam width or both? You can’t expect readers to keep up with the Sofirn catalogue. Go for a C8+, and upgrade if necessary. and well upgradable to more beam plus..
C8+ is not a C8 though.. But he wants a side switch and more throw/more power. Since he has already bought the sofirn, there are a few options. 1. Go with a dedomed XPG2 or even white flat to get more throw but a more narrow beam. 2. Sliced SST40 or dedomed XPL V6 to get similar beam size as XPL HI but with a bit more power/intensity. 3. Go with a XHP35 or XHP50 and boost driver. This might get you a larger beam and more output, but the beam intensity will go down since the available boost drivers are not very powerful. 4. Go with 2×18350 and sliced XHP70.2. This will get you a lot of power and decent throw. 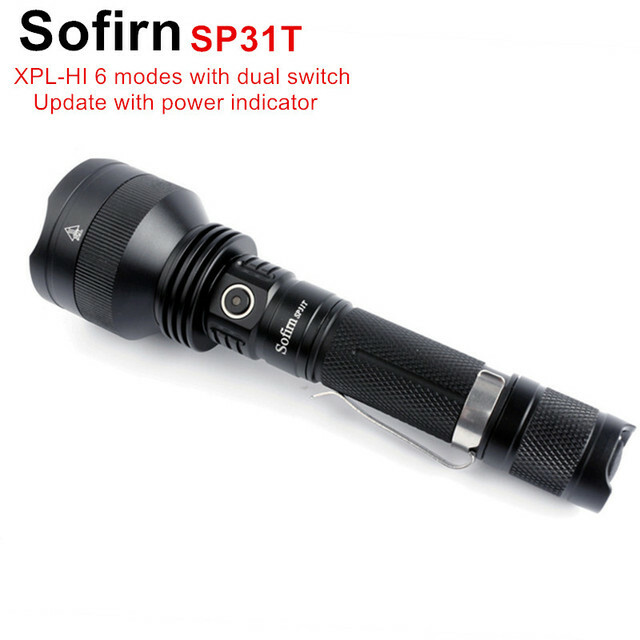 If the OP wants more power and throw there are better lights than the sofirn to get it, but since he already bought it, I think the above options are what he has. This light uses a buck driver, which is not such a good idea with an XP-L HI or XP-G2 because they have high Vf. The “White Flat” would work very well i.m.o. Low Vf and very tiny die. And since it’s a regulated buck driver, that means not only will the LED run in a good and efficient zone, but it will stay at max brightness for a long time. It will also give you a ton more throw. The buck driver most likely is not powerful enough to drive any of these emitters optimally, so it will have to go in any case. 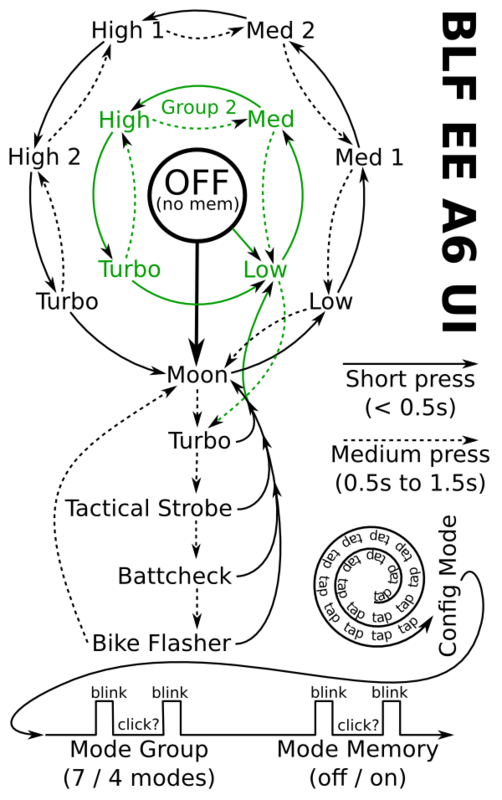 If C8 reaches high output too slowly, change mode group and/or use mode memory? By ‘slow’ I mean it takes too long to scroll through the modes to get to full power. What I’m after is instant full power as soon as I hit the button. I don’t really want multi modes on this particular torch. I’m sure my C8 could be made to throw a bit further, but it’ll never have the side switch that I want. I don’t want a tiny spot of light either. I’m happy with the XPL-HI, but need a bit more range. This light hasn’t cost a lot, so if the consensus is that it’s not right for the job, then I’m open to suggestions, but I want something that fits in a jacket pocket. You should just be able to set mode memory on to achieve that. What version of the C8 do you have? I’ve fitted a A17DD fet driver to my C8. Can’t remember what the tail amperage is though without checking. I certainly wouldn’t try to dissuade you from buying/modding another light (I think that’s like… illegal here?) but in the meantime you can use this to set up the mode memory on your C8 and IDK if you’re on 4-mode or 7-mode but changing that will make mode switching way faster too. Yes, I can change the UI so that the C8 goes straight to turbo, but that won’t increase throw or make it any easier to handle/switch on. I need a bit more throw than I’m getting with the C8. My L6 throws further. Thinking of a SST-40 driven to the max. Yes, although it depends on what you consider optimal. Don’t know if the stock driver is moddable to do 4 Amperes or 4.5 Amperes. I mean, you can put another sense resistor on top of the stock one, but the coil may get too hot..
SST-40 wont beat XPL HI for throw in a C8 unless its dedomed. Youre gonna get more backscatter/glare unless ypur C8 is already cool white too. D1S, GT Mini or Oslon emitter in C8 are the only real choices for more throw from the same size light. I have two Convoy C8s, an unmodified Silver one and a modified black one. The Silver C8 has 2.8A at the tail on maximum and the Black one has 4.3A at the tail on max. The thing is, there is little difference in throw between the two, to my eyes at least. I would have thought the modified one would throw noticeably further. Same emitters, etc. between the two? Maybe the higher amperage one is a lower output bin or outlier emitter too? Hard to say with only current measurements. This should be very similar to a C8 in throw/CD assuming similar reflector depth if it’s really running 10W & around 2.8-3A. There is the benefit of a side switch in addition to the tail on/off which I like. Bistro UI, cool. It seems fairly priced at $20, so compared to a Convoy L4, it’s a decent bargain. The Silver C8 has 2.8A at the tail on maximum and the Black one has 4.3A at the tail on max. Is this measured or theoretical? Was wondering if your batteries are up to the job or whether one with a lower internal resistance would help your C8. Also, what tint is your XP-L Hi? I have both the 1a and 3a tints (in silver Convoy C8s from Fasttech) and can definitely see further with the 1a. Amps are measured. Both C8s have XPL-HI emitters, but I’m not sure whether they are the same tint. It looks quite nice and decent quality, however the switch and the driver appear to be held in place by press-fit and not by threaded collars. This may mean that this torch stays standard. Not good when I bought it specifically for modding. I took the SP31T and my modified C8 out on last nights dog walk and I was quite pleased with the SP31T. It threw a little further than my modified C8. The beam was slightly narrower than the C8. I really liked the side switch for mode changing. It’s unfortunate that Sofirn have decided to press-fit components into the body as I think this torch would be great in modified form. If I could drive the emitter harder, I’m sure it would give me a the bit more throw that I’m looking for. So it’s back to the drawing board in my search for a compact thrower with enough throw for my needs.